Ever since I started planning my trip to Dharamsala and began reading and researching this region of the Himalayas, I immediately knew that everything regarding Tibetan refugees and related topics, interested me. “Dharamsala days, Dharamsala nights”, was the only reference book I had read on the matter and after being here for a month, I figured it was time to start interviewing and meeting people who could make me feel more familiar to this population and their reality. Yesterday as I walked around McLoed Ganj- the town adjacent to Bhagsu where the headquarters of the Tibetan Government in exile stands- my wish finally came true. In a restaurant on a hill nearby the temple and residence of the Dalai Lama, I met three Tibetan refugees, more or less my age. Initially they were sat outside enjoying one of the few dry days of monsoon season. Later on a cooker with a boiling soup was placed on the opposite end of the long table where my friends and I were sat down inside the restaurant. Shortly after one of the waitresses brought out several plates with fresh veggies, raw meat and other seasonings and placed it alongside the other dishes. The Tibetans walked inside and sat next to us on the table on the floor surrounded by pillows. They began adding the veggies and the meat, stiring the concoction, and anxiously waiting for it to cook. They had big smiles and grinned and laughed often. I asked them what they were preparing and immediately, Ten Phum, the most outspoken of the three, who calls himself a “surviving actor”, began explaining that it was a Chinese spicy dish considered by some to be “addictive and delicious”. The other two guys were Ten Phum’s childhood friends, also Tibetan refugees: Ten Top, a designer who completed his studies in South Korea, where he was offered a scholarship, and Tenzin Tsewang, a filmmaker who studied in Delhi. As the meal was consumed, the conversation began flowing and I soon realized I was interested in their story and what they had to say. Ten Phum, began telling me how he arrived to India through the Himalayas from Tibet with his aunt, when he was eleven. Because of the fact visas at that time were only granted to people over the age of 18, “during certain checkpoints, I had to cover under blankets and hide”. Even so, he considers being fortunate in comparison to others who are detained, encarcerated and even tortured by Chinese authorities if caught during this exodus journey. Although Ten Phum has not seen the rest of his family since the moment he left, for they all remain back in Tibet, he contacts them by phone once in a while. “Half of my heart is in Tibet, and the other half is here”, he says. “I don’t want to go back even though I miss them”. When I ask him more about his family, Ten Phum reaffirms that he doesn’t really consider having a family, other than his childhood friends. 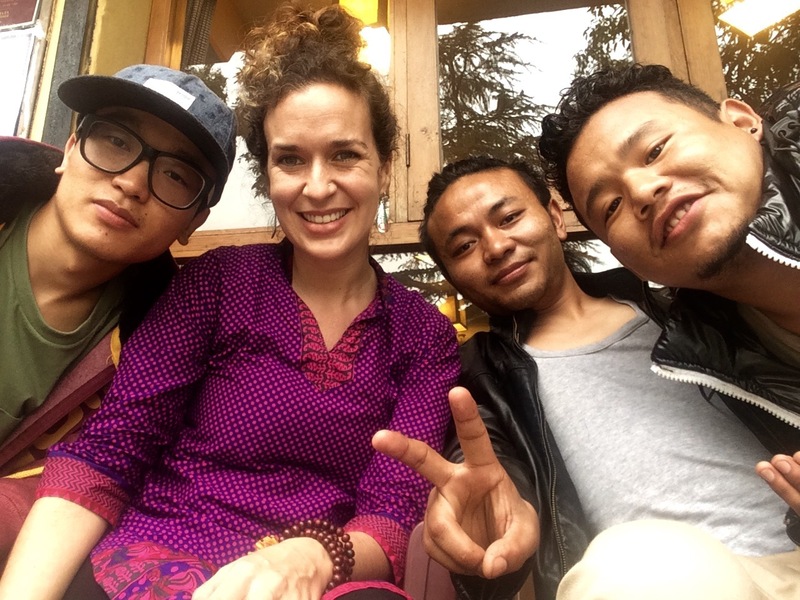 These three friends who met while attending classes in a Tibetan boarding school in McLoed, not only share a similar story, but now also work on creative projects together. Their mission is clear. They wish to share their life stories and for their land to be free from Chinese occupation once again. Because Tibetans face harsh censorship and are unable to voice their opinions in their own country, these three friends use art as a vehicle to spread their message of love and compassion as young political refugees in India. “I just want to make people in Tibet happy and proud. I wish humanity in general were free. Many of us have lost our sensibility and through my message I hope to change this”, says Ten Thop. Their most recent collaboration is inspired by a poetry book Ten Phum wrote in English. “The Wanderer” is based on the spiritual journey of the main character who is seeking his true path in life. Thanks to the sponsorship of tourists and foreign entrepreneurs, the book will finally be published and presented this Friday in McLoed. Ten Phum is obviously thrilled and has gone to explore other creative projects in film together with Tenzin. They are currently finishing the script in order to film a movie based on the same book. Ten Phum, Ten Top, and Tenzin’s stories are inspiring. Even though their lives have been filled with constant struggles, the need to detach from their families and culture, and in many cases face discrimination due to their permanent status as Tibetan refugees- they hold no anger or resentment. “Should I say thank you to India or use my efforts to share my message with Tibet?”, says Ten Phum. These three guys, who consider themselves outsiders in both India and their own countries, are no different from the majority of people their age. As the afternoon unfolds and we continue to share stories and experiences, I soon realize that in spite of our differences, at the end of the day, we are all quite similar. We all wish for the same. We are all wanderers. And we all hope our efforts will lead us to the path of our own spiritual journey.